I don't know about you, but I'm thoroughly sick of the cold weather and random bursts of snow now - please hurry up Spring! I decided to draw this as a remedy for the wintry weather we've been having. It reminds me of Summer days. 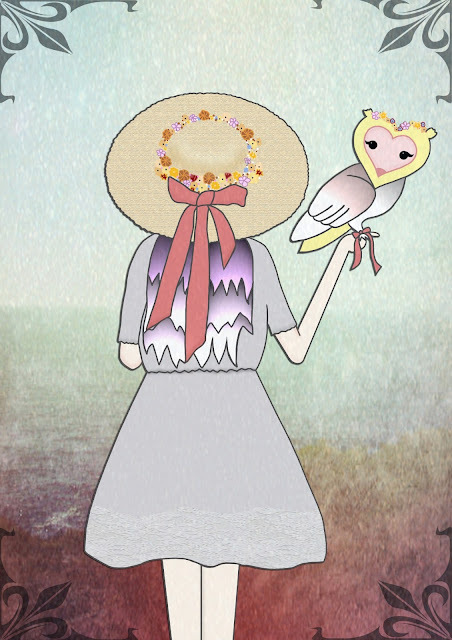 I decided to give the owl a little heart shaped face with a flower crown to match the girls hat. I really love owls - I wish I could have this one as a pet! I did once get to stroke a baby barn owl, and it was possibly the softest thing ever! So cute. Anyway, I'm planning on curling up with my hot water bottle again tonight - so glad I decided to purchase one! I hope you all like this illustration. I also decided (this morning) that I would try adding a new feature called 'Inspired by' where I select a couple of items that relate to my illustration in some way! I probably won't end up doing it for every illustration, but I'll see how it goes. 1. Orange Stripe Sun Hat, River Island, £15.00. Seeing as the girl in the illustration has an awesome sun hat on, I decided to include this! The only thing that is missing is a ribbon and some flowers, but if you were really crafty I'm sure these things could be added quite easily. 2. Three Owls on a Branch cushion, Cherry Rainbow, £18.00. How about an adorable owl cushion from Cherry Rainbow. I really love the colours and vintage look to this and would definitely be proud to have it on my sofa! 3. Pink Fox Bag, Cherry Rainbow, £14.00. This is another piece from Cherry Rainbow, and I think it's so pretty. I could imagine the girl in the illustration carrying this around, and it's definitely my favourite of the 'fox' bags I've seen lately. 4. Revlon Just Bitten Balm Stain in Cherish, Boots, £7.99. Although these are priced at £7.99, they are usually on offer at Boots or Superdrug! I picked up the colour Cherish, and it's gorgeous. A really pretty pastel pink shade, and perfect for Spring/Summer. I love these because they are long-wearing and I hate re-applying lip colour (pet peeve). 5. Hawaiian Tropic Protective Sun Lotion SPF 30 200 ml, Boots, £12.59. You may think I have lost my mind at this point, seeing as the weather is freaking freezing, but this illustration reminds me of Summer, and that's why I'm including it! I really like this brand, the cream smells yummy, and the SPF is high enough for my insanely pale skin. Anyway, that's all for now - hope you liked this new idea! Anyway, this is one lovely piece. I really like the colors in the background as well. And I agree, bring on the Spring! I love the owls little heart shaped face, so cute! I also want it to be summer so bad already, hurry!